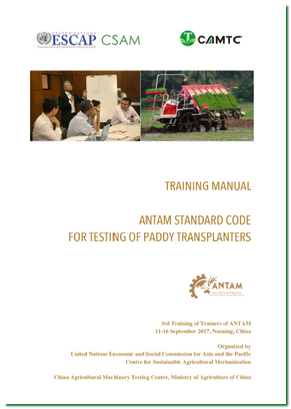 This training manual has been prepared to support the 3rd Training of Trainers of the Asian and Pacific Network for Testing of Agricultural Machinery (ANTAM) being organized in Nanning, China, on 11-16 September, 2017. The training is part of the capacity building initiatives of the Centre for Sustainable Agricultural Mechanization of the United Nations Economic and Social Commission for Asia and the Pacific (UNESCAP-CSAM) in support of sustainable agricultural mechanization. The event is being jointly organized by UNESCAP- CSAM and the China Agricultural Machinery Testing Centre of the Ministry of Agriculture of China (CAMTC/ MoA).